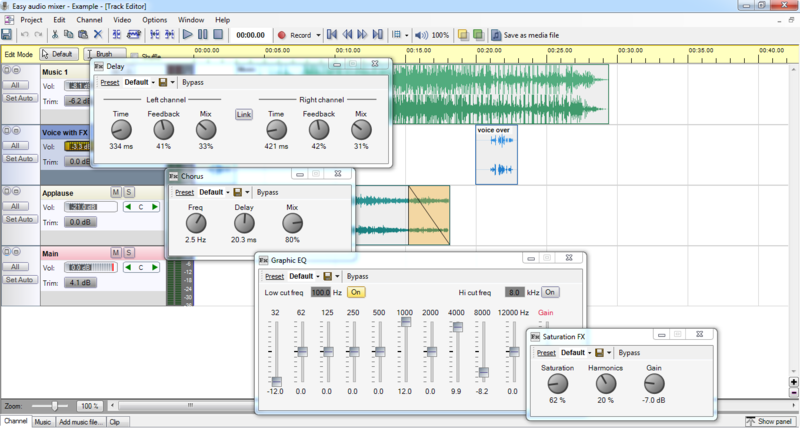 Easy audio mixer is a multi track editor designed for average users. 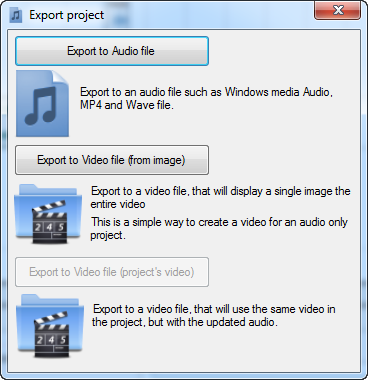 With it, you will be creating your own audio projects even if you never used a multi track editor or a mixer. Don't let the simplicity of the program fool you. 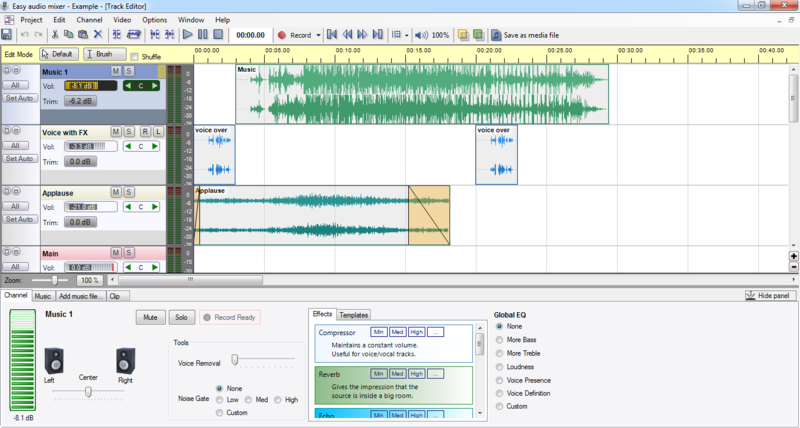 The software provides most of the tools found in much more expensive studio software. Plus, the learning curve is really fast. 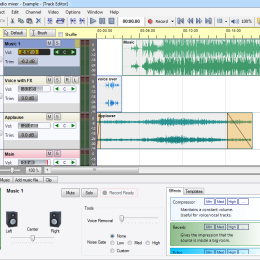 Easy Audio Mixer uses a simple user interface that has the characteristic grey shades and lines to separate different menu bars. By arranging everything in two ribbons, one at the very top and another at the bottom, the developer created enough space at the center to help you visualize and feel the audio you are mixing. This makes it quite pleasant to use even to the beginner. The software knows what it came to do. It knows it isn't a high end tool so it doesn't bother you with complex tweaks or by hiding simple functionality behind dropdowns. You have a set of simple controls and buttons that are just enough to get the job done without confusing you. Clicking on a button that requires prerequisites pops up a dialog with directions on what you should do. For instance, clicking on the Record button without choosing an input channel will prompt a guide on how to activate this. The same applies to all buttons making Easy Audio Mixer really easy to use. Templates always make life easier - especially if they are practical and well thought out. 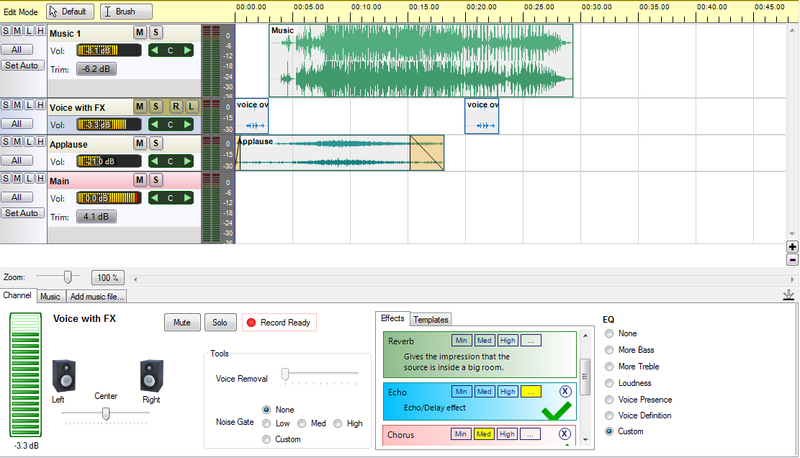 Easy Audio Mixer has the perfect balance of this in its few but powerful project templates. 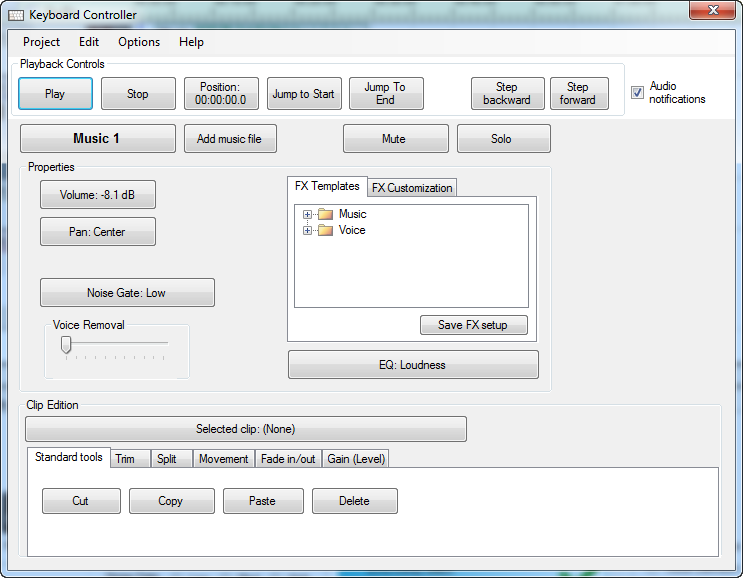 They Keyboard controller feature, allows you to control the software using only the keyboard. With voice notifications and designed to be used with screen readers, it allows people with visual impairment to create audio projects. You can buy Easy audio mixer ( 19.50 US$) directly from us. The payment service is provided by BMT Micro based in the U.S., which support all major credit cards, paypal, wire transfer and check payment methods. When you order online, your order will be processed immediately. You will receive the instructions to download and install the full version as soon as you finish ordering. G.F. Software is formed by computer programmer Gabriel Fernandez (hence the name G.F. Software). As a musician, most of my products are music related. G.F. Software has been online for more than 10 years, with customers all over the world. Everything is integrated into a single window. 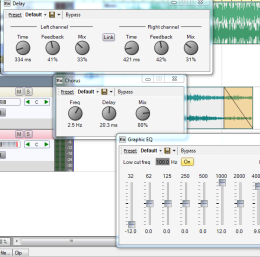 Making mixing and editing much easier. Once your project is ready. 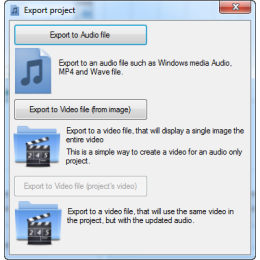 Export it as at audio or video file. With the Keyboard controller window. You can use the keyboard to work on your project without the need of a mouse. Designed so it can be used by people with visual impairment.